1. Download theSRS – Preliminary Planning Overviewand review it to prepare for your System Request Form. 2. Download theSystem Request Template. 3. 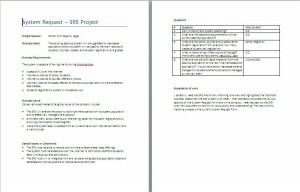 Complete the System Request Form for the SRS based on your review of the SRS – Preliminary Planning Overview. See the Figure 2-13 example in the text. 4. As you create the System Request, generate and document at least five questions and specify who you think the best point of contact might be for each question. 5. Explain your work and the decisions you made to arrive at your proposed solution. very nice work. really appreciated.